Very comfortable. I have it in a spare bedroom. Its Very convenient to order with overstock. They delivered and set it up. My house guest say they slept really well. WOW ! Yes WOW in the most excellent way. I do not use that explanative lightly. At our home I am the person that does the research before we make a purchase. I have learned way to much about memory foam , spring support and hybrid beds. For our needs I decided upon a hybrid mattress. You get the support of the springs and the lushness of the memory foam without as much heat. Serta is a name synonymous with comfortable sleeping. WE BOTH have had the best nights sleep of our lifetime upon this mattress and foundation set.I chose the low profile foundation as my spouse is vertically challenged. It turned out to be the right choice. With our bed frame the height is just right. I do seriously recommend this set to anyone looking for a comfortable nights sleep. It is the most luxurious set we have ever slept on. If there were 10 stars I would give it 20! Yes it is that dreamy! The product information sells the set short. I am guessing they didn't want to brag. I moved from a firm memory foam mattress to this one, and it was a really good move. 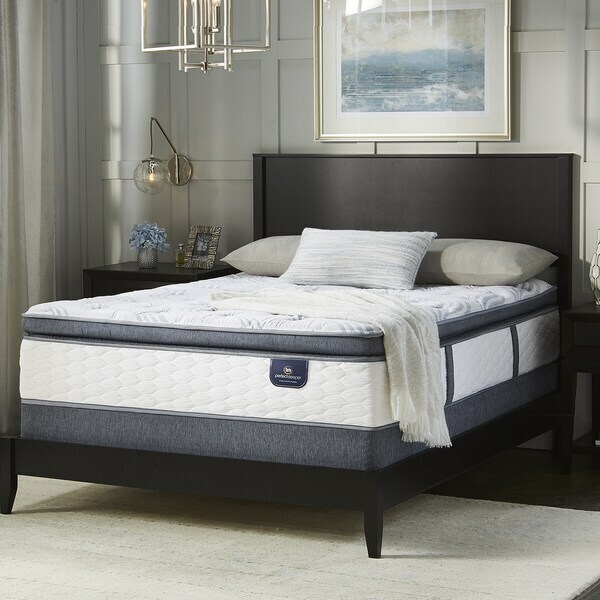 Risky to order a mattress set online, know, but knowing Serta Perfect Sleepers from the past as being high quality, I decided I hated going to mattress stores more. It doesn't feel all that sink-in plush to me, but it's softer than a firm, and my bones are really liking it! This has been one of my best purchases yet. I changed from a memory foam mattress to this in a king size and I must say, it has helped me "an insomniac" sleep better! Wonderful, super comfortable mattress set. What a great value! We are extremely pleased with this purchase and would not hesitate to recommend this set to anyone looking to buy. Very pleased with o.com and this Serta product! I've had this mattress about a year now. It is very comfortable. Quality seems excellent. The only negative comment would be that it is noticably shorter than my last mattress, so leaves a gap at either the head of foot of the bed. I had a friend there at delivery, so didn't see them side-by-side, but would guess a good 4 inch difference. Enough that the pillows keep falling between the headboard and mattress. The mattress is great quality, but it is firm. We had to buy a memory foam topper to make it comfortable to sleep on. Hopefully the mattress will start to get broken in and will last us a long time. I bought this mattress for myself. I'm very particular on the quality of the mattress. I look for support and longevity. All the mattresses in my home are Serta's. My daughter has a memory foam mattress and she prefers this mattress over her $ mattress. Dealing with a bad back I needed a mattress that supported yet wasn't firm. Unsure about ordering something so critical to my sleep, I spent hours researching and decided the Serta Super Pillow Top was worth a try and I couldn't be happier. My sleep has improved! Delivery took 3 weeks so well within the time allowed for delivery. Great mattress, thank you. Horrible mattress. Read previous reviews, and it seemed like good item. But it wasn’t: After the first night, the pillow top dented nearly 2 inches, and didn’t flatten out. So, there’s a permanent trough in the mattress, and you feel like you’re sleeping on uneven small hills, and roll into the sunken “valley.” And, the person sleeping here in only 160 pounds, so the permanent concave valley in the pillow should not have happened. I have severe arthritis. I am only 56 yet my body inside is that of an 85 year old. This mattress is awesome. I sleep so well it is totally amazing. I was hesitant in buying, however, when I read a review about a woman having fibromyalgia and loving this mattress, I went ahead and bought it. Trust me I cannot wait to go to sleep everyday in it. This is truly a wonderful and well made mattress and I would recommend to everyone. What a complete let down. Within only a few weeks, the mattress started to cave where each of us slept, leaving a "lump" right down the middle. And the motion transfer is the worst! I can feel my husband breathing from the other side of the king size mattress! Tried different box springs and a different frame and nothing improved. Total waste of money. I had such high hopes and excitement for this mattress and I'm completely disappointed. This mattress is sumptuous! And the price was great . *** for a king sized, name brand, pillow topped mattress with free shipping ... CRAZY GOOD!!! Love love love this mattress. My kids fight over who is going to sleep in it. I was leery about buying a mattress online, but I was not disappointed. Yes I did buy a mattress off the internet! UPDATE: March 2019....I've owned it for little over 3 yrs. Around the end of 2 1/2 years the pillow top is not so comfy. It has developed body imprints and is very uncomfortable. I've turned the mattress, top to foot...but that only lasted so long. I am now in the process of seeing what this limited warranty actually covers when it says "10 Year Limited Warranty". If this mattress is only good for 2 1/2 years.... to be continued. * * * * * * * * * * * * * * So yes I was a bit hesitant purchasing a mattress off the internet! However, I did my homework and knew I wanted a pillowtop. And I knew the Serta Perfect Sleeper name was one I could trust and being backed up by Overstock I hit the buy button! I had a bit of a snafu with the delivery company. One quick call to Overstock and it was like I had an Uncle in the furniture business! Overstock got right on it and I mean they were AMAZING and I had my mattress that day waiting for me when I got home!!!!! hahaah it was SOooo pretty too! I've slept so well and am very pleased with this mattress, the price was fantastic and OVERSTOCK.com is my go to place for everything. I’ve had the bed 6 months now and still sleeps as great as the first night. Not disappointed with my purchase at all and overstock had the best price on it. NOT HAPPY WITH SUPPORT AND EDGES ARE TO FIRM MAKING IT HARD TO GET UP. "Do you sell this bed frame?" The frame is not available. "Is this mattress delivered curbside or white glove delivery?" "Can I use the leasing program for this mattress?" "Is the comfort level of this mattress medium or soft?" This is plush. I hope it helps. "What is the height of the standard box spring? What is the total height of the mattress and standard box spring?" 9" box spring and 12" mattress. I hope it helps. "Do I need a bed frame?" Yes...if you don't want it sitting on the floor. This product is a set, however, the mattress top is sold by itself. If you buy just the mattress then you would be able to place on a platform. Overstock has great options for bed platforms. "I ordered just the mattress, but am now realizing that I am going to need the boxspring. How can I order just the boxspring?"